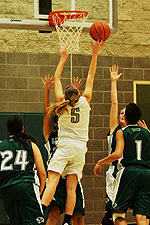 REDDING, Calif. - The Simpson University women’s basketball program announces the signing of Raegan Lille for the 2014-2015 season. Lille is a freshman from Colfax, Calif. She received Pioneer Valley all-league honors in 2012, 2013, and 2014 and won nine all-tournament awards from 2011-2014. During the 2014 season, she was varsity team captain and received Sacramento all-city honorable mention honors. Click here for news on other Simpson women's basketball recruits.